There is a lot of emphasis on gardening these days. Growing your own food not only puts healthy food on your table, but can save you a lot of money, as well. But there is another, often ignored, benefit. While you are gardening, you are exercising. Isn't that great news? Gardening is great exercise for the body. Researchers estimate that gardening burns 300 calories per hour. Heavy yard work can burn up to 600 calories. Gardening is also very cathartic for the soul. I find that digging in the dirt (without headphones blaring in my ears) gives me time to just rest my mind. We have so much information we are processing each and every day, that I really appreciate the quiet time I have in my garden. Gardening is a wonderful way to stay healthy! It is challenging and fun to do and can take as much time as you want to give to it. Don't have a lot of time? 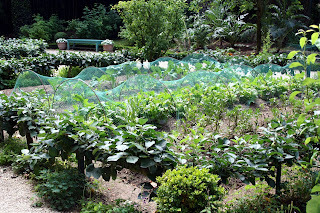 Plant a square foot garden (I will write more about that later). Have some extra time? Plant a large, traditional style garden and sell your extra produce at your local farmer's market. Your garden can be designed to meet the needs of you and your family. So if you have been thinking about planting a garden, you should do it! It will be worth it--in so many ways! I was just catching up on comments at Christian Mommy Blogger on my guest post last month. I was wondering if you would be interested in guest posting for me? You had mentioned medicinal benefits of herbs . . . I would love to do a guest post! Can you email me details? You can email at theprudentlife@gmail.com. I will look forward to hearing from you!